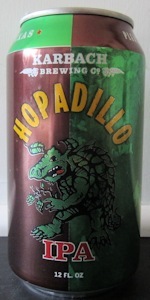 Hopadillo IPA | Karbach Brewing Co.
A "Texas-style IPA" at ~70 IBU and brewed with a combination of American, English and German hops (German Magnum, Chinook, Amarillo, Citra, Simcoe, East Kent Goldings). Dry-hopped too. 12 fl oz aluminum can with appealing label art acquired as part of a 6 pack for $13.00 USD at the Growler Room and served into a pilsner glass in Austin, Texas. Reviewed live. Expectations are above average given the brewery. Reviewed as an IPA because it identifies as such in the name and on the label. No ABV is listed on the can. No best before/brewed on date. Bottom of can says "241K-3 03508." "Dry hopped." Served cold - straight from me fridge. Side-poured with standard vigor as no carbonation issues are anticipated. A: No bubble show forms as I pour. Pours a three finger wide head of khaki colour. Nice creaminess and thickness. No lacing clings to the sides of the glass as the head recedes. Head retention is good - about 6-7 minutes. Body colour is a clear orange-copper of above average vibrance. Translucent/transparent. No yeast particles are visible. Overall, it's pretty standard fare for the style and ABV. Not unique or special, but there are no obvious flaws. I'm looking forward to trying it. Sm: Pine, light onion (amarillo/simcoe methinks), floral hop character, herbal hop character, caramalt, pale malt, and biscuit malts. Not as resinous as you might expect. The caramalt mutes any citrus; I'm not getting the orange or grapefruit I expected. A bit buttery. The malts counteract the hops a bit more than is necessary; I do like the hoppy edge - especialy the pine, but the hop choices don't seem ideal based on the aroma alone. A pleasant hoppy aroma of mild strength. No yeast character or alcohol is detectable. No off-notes. T: Hop bitterness is nicely concealed by the malty sweetness for the most part. It got a nice piney edge, which is the dominant hop note (to its benefit). Floral, herbal, and vague citrusy hop notes are in there too. Pale malts, caramalts, pilsner malts, and some biscuit malts comprise the foundation. It's by no means a gestalt beer, but it has cohesion and decent balance. Lightly oniony. Could use more complexity and subtlety, but then so could most beers. It's fairly complex as-is, which I respect. Depth of flavour is average for the style, as is duration of flavour. Intensity of flavour is slightly below average for the style. No yeast character or alcohol comes through. I don't get any overt off-flavours either. As far as my personal tastes go, I'm not finding the naked hop bitterness and warm tropical pineapple notes I despise in an IPA. It could be more resinous. Hop choices aren't great. Mf: Coarsens on the climax due to the hop bitterness, but it's otherwise smooth and wet. Unrefreshing. Sticky. Lightly oily. A bit buttery. Crisp. Overcarbonated, with a bit of a bite. Not as approachable as many beers in the style. Decent body and presence on the palate. Suits the flavour profile decently, but doesn't come across custom-tailored to it. A bit abrasive, but otherwise not too flawed. Far from ideal for the style. Dr: A downable little IPA from Karbach. At this price point, it's not worth getting again. I'm also asserting that it's more affordable in Houston, but I still doubt I'd pick it up again. There're some nice elements here, but it's by no means a world-class IPA. Slightly above average. I wouldn't recommend it to friends or trade partners. The resinous pine note was a highlight for me. The onion, hop bitterness, and overcarbonated biting mouthfeel will be a downside for many. Might pair decently with spicy food. Underwhelming hop profile. Lacks hop pungency as well as intricacy. Shallow and simplistic. At ~70 IBU and brewed with a combination of American, English and German hops (German Magnum, Chinook, Amarillo, Citra, Simcoe, East Kent Goldings), this is a very different IPA. Don’t expect this to be a typical American IPA, as the range of hop flavours runs the gamut, which might be too much for some. Nonetheless, this is an interesting hop bomb of complex flavors. Toasted orange and crowned with a thick white head which is not only very sticky, but also great with the retention. It smells of orange peel, grapefruit, and hemp. For this California guy, Hopadillo doesn't deliver the strong assault of hops as I'm used to getting in my IPA. Instead, Hopadillo makes up with subtleness. The toasted sugar base hits first, with little notes of resin, plus orange and lemon that are placed well. Hearty and medium bodied, trailed with just a little bitterness, it's a beer that I enjoyed. 12 oz can with a 26 April 2019 in March 2019. Pours with a durable, frothy, white head and a deep amber body. Excellent clarity. Complex flavor and aroma. Mild bitterness up front but it leaves a quite bitter aftertaste. Pine-centric with some bready grain flavors. Alcohol is surprisingly obvious in the aroma. Poured from a can. Clear dark golden color. Head about an inch thick, persistent. Mostly citrus nose, slight floral hop and malt is there, but barely. Malt comes through more on the palate. Goes with the citrus and some tropical notes. Tasty, light and easy to drink. Not to filling, Amarillo hops with bitter finish. Decent go to beer. Mahogany in color with an off white head. Not terribly aromatic, but smells like an IPA. Tastes hoppy and bitter, with a slight sweetness, nutty. Delivers a nice hop mouth tingle. Not the greatest IPA I've had, but I wasn't disappointed. Hopadillo IPA from Karbach Brewing Co.